New Community Classes in East Los Angeles Starting March 7th! A few months back UpRising Yoga (URY) was the happy and thankful recipient of Lululemon’s Here To Be Grant, which is a community-based social impact program to create access to the healing benefits of yoga in underserved communities. 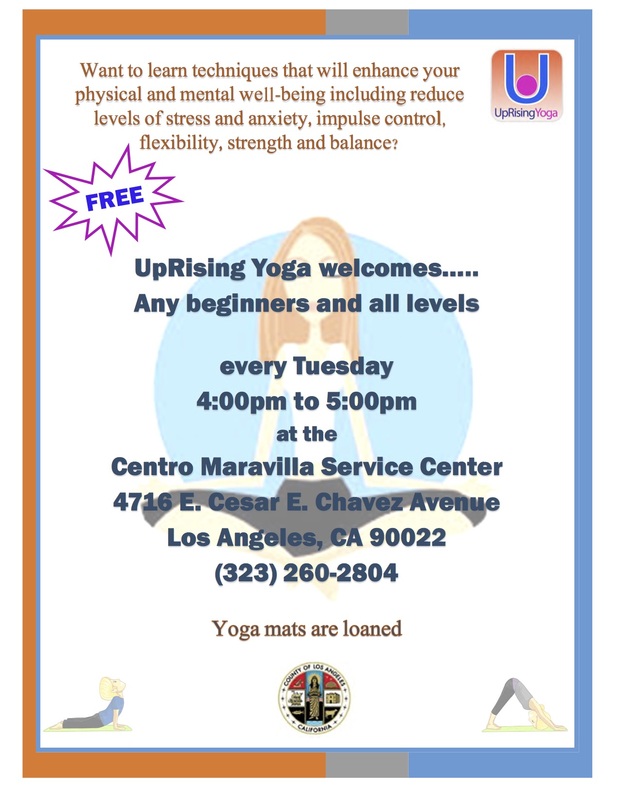 We are excited to announce that with this grant we will be offering a new weekly yoga class in East Los Angeles at Centro Maravilla Community Center beginning March 7, 2017. As always, our community yoga classes are completely free and open to the public. You don’t need to sign up or even bring anything. All you have to do is show up! We provide the yoga mats, Spanish translation, and a warm and trained URY teacher to guide you through your practice. We are proud to partner with Los Angeles County Centro Maravilla. UpRising Yoga's office in East Los Angeles gave us a community to know and love and we are very excited to share our yoga program with this great group! Join us on March 7th for this kick off class with Founder, Jill Marie Ippolito. This will be a special class and we hope to see you all there! Thank you to URY Ambassador Brent Laffoon, Jackie Koch and Monica Currier from LuLuLemon Brentwood and Chloe Abraham and Julia Bowman from LuluLemon Malibu for their support our mission. It is the support of others generosity and kindness that allows us to do this work and impact the lives of others. Print the flyer below and share with friends! Please meet URY Teacher and Volunteer, De Jur Jones, aka “The Lavender Queen,” for her prolific and soothing use of Lavender. She teaches both at Central Juvenile Hall and many of our Free Community classes throughout Los Angeles. De Jur has been working with UpRising Yoga since 2012, and teaches a relaxing Yin/Restorative yoga that is sure to melt your heart and soul. De Jur has a strong commitment towards healing, community, and volunteerism. In addition to her work with URY, she also works with Accessible Yoga, International Association of Yoga Therapists, Yoga and Body Image Coalition, Love More Movement, and Prison Yoga and Mindfulness. ​Q: What is your spirit animal? De Jur J: French Bulldogs! I feel such a sense of happiness when I encounter them. Please don’t tell my feline, Simba. I don’t want her to feel jealous. I have met a fair amount of Frenchies at LAX and on my flights. Looking their unique features and cute ears sends me over the moon. And, of course, there is the obligatory selfie moment. I have quite the photo collection with them. Q: Tell us about your interests/talents outside of yoga? De Jur J: I love going to plays. It’s not New York, but Los Angeles that has really great theater. Although productions in big, grand theaters are great, I enjoy the intimate environment of 50 and 99 seaters. My Mom and I will be going to see 946: The Amazing Story of Aldolphus Tips later this month. It was based on a children’s book. Another interest of mine is music concerts. I absolutely LOVE the Hollywood Bowl and every summer I can be found there for the many excellent concerts offered. I pack picnics and sit under the stars and get my soul restored musically. De Jur J: I had major surgery in 2001 and a friend suggested that I use Yoga as a therapy system to rehabilitate and get back to my long-standing career as a flight attendant. I never stopped. Over time, I felt better than ever, got fit, let go of some not so healthy habits, improved my diet, and learned how to cope differently with stressful situations. I love Yoga. It has saved my life in many ways. I had no intention of becoming a Yoga teacher…but here I am spreading the word of its multitude of healing benefits. De Jur J: My intention as a Yoga Therapist is to facilitate a healing process for those suffering from chronic stress and complex trauma. To show my students what self-care can look like and how Yoga Therapy can help us cope with and possibly alleviate many ailments and challenging health conditions. ​Q: Who are you trying to reach with your yoga and why? De Jur J: I want to reach people that are underserved, those living with depression and complex trauma, victims and survivors of abuse and poverty, those with low incomes, those in the justice system, all races, those that feel no hope, those who are under-resourced, those that are differently-abled, people of size, all ages and fitness levels and those that feel they have been marginalized. They are not “seen” in the mainstream Yoga world that I move in. I want them to know that I see them, they are welcome, I have experiences like theirs, I stand with them. I want them to know that there is a movement evolving to shatter the mainstream image of a Yogi in which Yoga really is for everyone and every body and does not require a costly studio membership …that Yoga is so much more, I want to serve them Yoga that represents “the rest of us”. Q: Tell us about a difficult or challenging time you experienced and how yoga help you? De Jur J: Every day at my other job, Yoga saves me. Being a flight attendant is very fast paced and can be arduous. Any job working with the public and self-managing all of the different personalities is extremely demanding, but add working in tight, crowded spaces where there is nowhere to “go” until back on the ground can sometimes overwhelm. I use breath awareness, chair Yoga, lots of water and stretches throughout the day helps me stay calm in the chaos…self-care at work. Q: What is your definition of healing? De Jur J: I think healing is setting aside a regular schedule for a non-negotiable, proactive plan to bring back a feeling of living in our bodies, overall peace, feeling connected, wellbeing, safety, joy, a zest for life and believing in limitless possibilities despite how things look. De Jur J: Having students communicate how differently they feel after class or how their lives have changed since they began their regular practice. I love when they share with me that family relations and dynamics have greatly improved with better communication, patience, kindness and renewed cooperation.